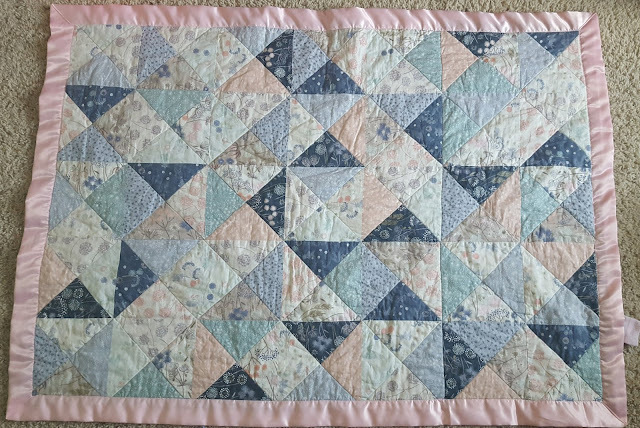 I decided needed a "spare" baby quilt for my little girl because the one I made for her specifically was so beautiful that I couldn't help but hang it up on the wall of her nursery. 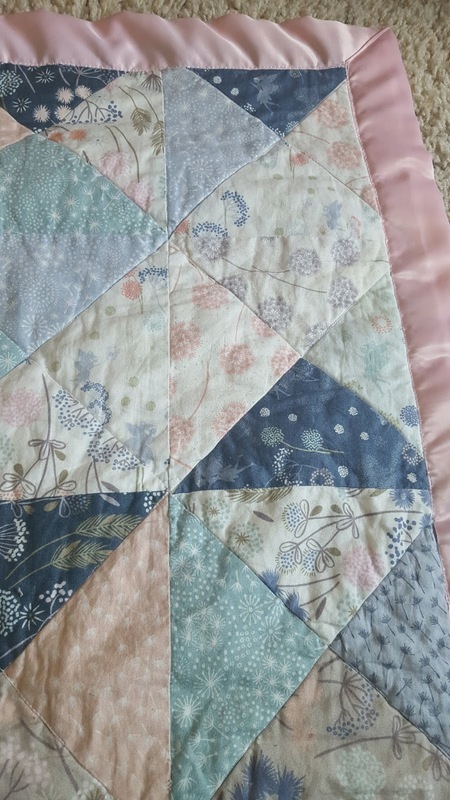 Luckily, in a burst of crazy fabric buying I had a fat quarter of Lewis & Irene "Make a Wish" fabric from the Fat Quarter Shop that I had bought because of the most amazingly cute little fairies and dandelions hidden in it, and also because I LOVE pastel colors paired with navy blue. For the pattern, I wanted to try out half square triangles per YouTube. But I didn't like how it was looking, so cut those in half again to make quarter square triangles. The small, delicate print looked much better with smaller blocks. I thought about placing them in a certain way, but in the end just did a randomized assortment that I thought looked nice. In person, the navy blue feels less abrupt. I finished it off with a light pink minky backing, quilted in the ditch, and added a pink satin blanky binding. 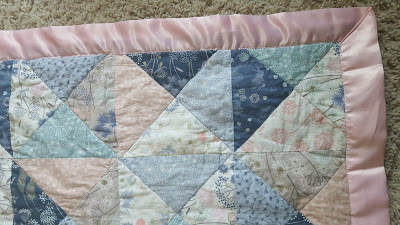 Also, I broke 5 needles on this quilt! Half square triangles are no joke! The places where 8 corners come together is so bulky. I'll need to figure out something next time to make it lay flatter.